We selected this stunning garden building for Kathy’s garden because it is something she had always dreamed of having. It is a traditional design with lovely Georgian windows and doors, fully insulated roof and walls with a laminate floor. Perfect for Kathy to sit in and look at her garden or watch her children and grandchildren play. It can be painted in a huge range of colours and we selected Protek’s ‘Leafy Herby’ green, with ‘Parsonage Cream’ windows and doors, so that it would have a natural look in the garden. The roof has cedar shingle tiles, which will fade to a lovely silver colour in a few years time. However, felt or eco slate effect tiles are also available. The interior has lovely tongue and groove redwood timber, which gives it a clean and classical look. We chose the 8’ x 8’ size, but it is available in smaller and larger sizes and there is a fantastic team of carpenters who install them. 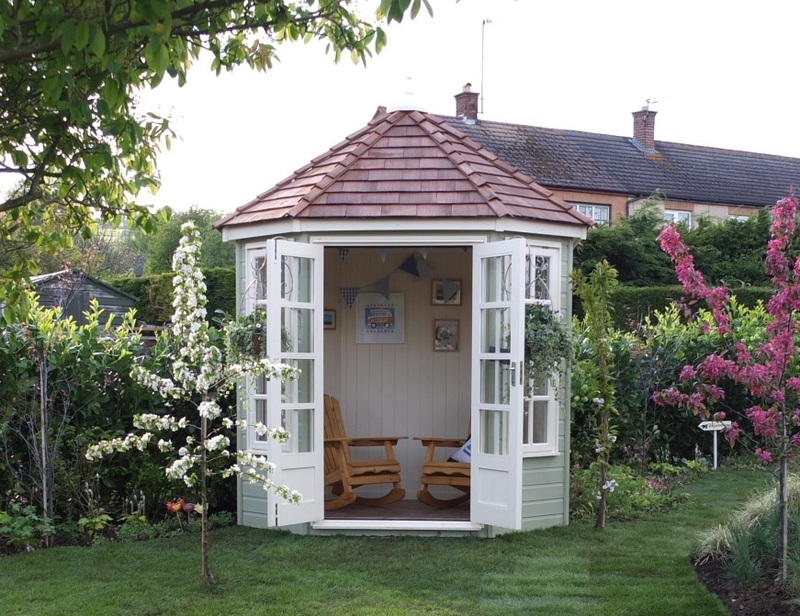 We think Kathy is going to enjoy some fantastic times in her summerhouse and it is a beautiful feature in her garden. We decided to plant laurel hedging in Kathy’s garden because it would provide an evergreen boundary and privacy from the neighbours. Laurel is a dense evergreen shrub with large, glossy, bright green leaves, which makes an ideal hedge. It produces modest white flowers in spring and red berries in autumn, but both are insignificant and really it is chosen for its vibrant foliage. Laurel hedging only needs cutting once a year, around August time and is very hardy, easy to grow and is even happy in the shade. Although we used larger plants, most people start a hedge off from smaller plants, which makes it incredibly cost effective…much cheaper than a fence. Planting a hedge is a great garden DIY project and all you need is a free day, a spade, plants and some compost to give your hedge a good start (unless you’re in a rural area where you might need rabbit guards). A very rough indication of an average evergreen hedge cost for 10m is £210 assuming £7 plants with 3 per metre. We think hedges are great because they also provide food and nesting sites for insects and birds, plus Kathy’s garden was quite windy, so a fence just wouldn’t have been suitable. There really is a hedging plant to suit all gardens, whether you want a slow growing, spiny, shade loving or flowering one. The laurel 5’ tall laurel hedging plants we used were £34.99, but Love Your Garden viewers will get a 10% discount using the product code ALAN. We decided to have an inground trampoline in Kathy’s garden as it would provide hours of fun for the children, yet blend into the garden. We dug a big hole and used the clever and effective TDU retaining wall kit, to prevent the sides falling in and the put the inground trampoline in the hole. 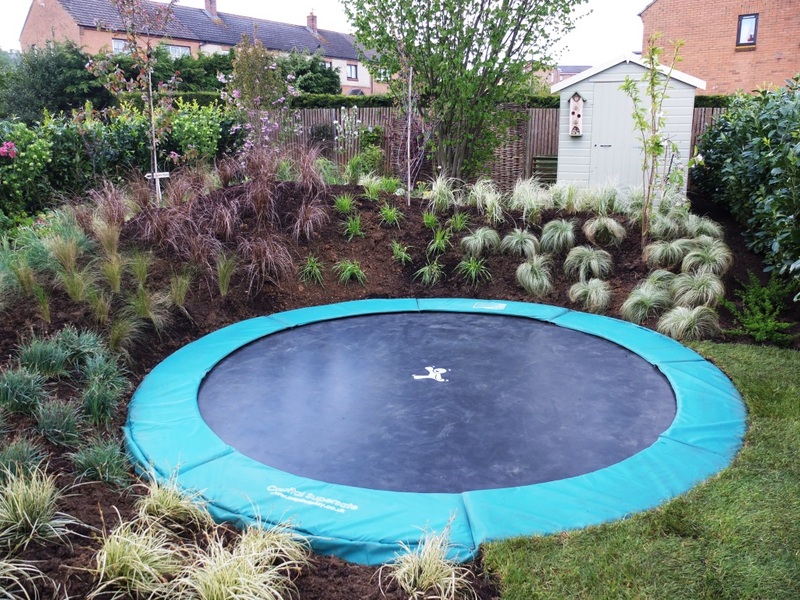 An in-ground trampoline will not look so visible and will be more aesthetically pleasing in your garden. You will not need a trampoline safety enclosure (but you may still elect to use one) which will also look less unsightly and save you money. There is less distance for your children to fall off and cause injury. Also there is no danger of injury with small children or animals walking under the trampoline. Younger children can play on the trampoline safely and without needing assistance to get on and off the trampoline. There is no grass under an in-ground trampoline which needs mowing and looking after. In-ground trampolines eliminate the possibility of damage occurring because your trampoline cannot be blown away in high winds. We needed to find a way of getting Tony round the garden, without having to put a solid path down for his wheelchair. We were delighted when we found this amazing product that provides stability under grass. 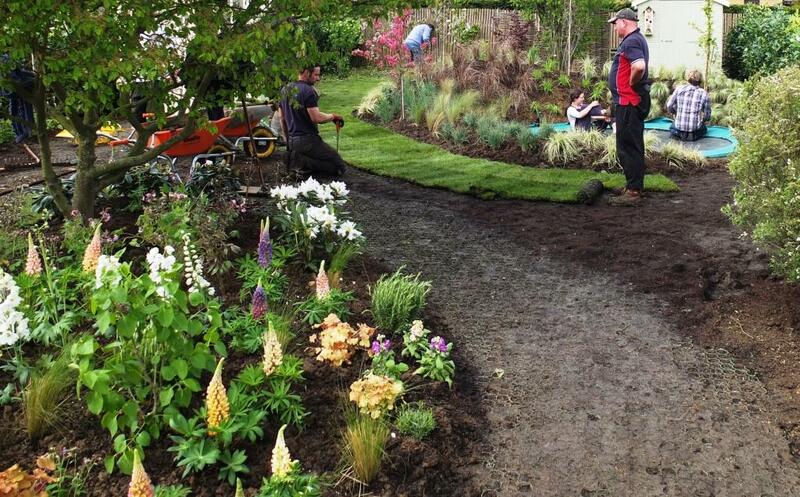 It was easy to lay – we put down some skalpins, laid and clicked the panels together, filled the honeycomb structure with topsoil then turfed over the top. It is environmentally friendly and it is suitable for pedestrians, cars, 4x4s and even heavy commercial or emergency vehicles. The design of the grid allows for conventional maintenance of your lawn with ride-on or hand lawn mowers. 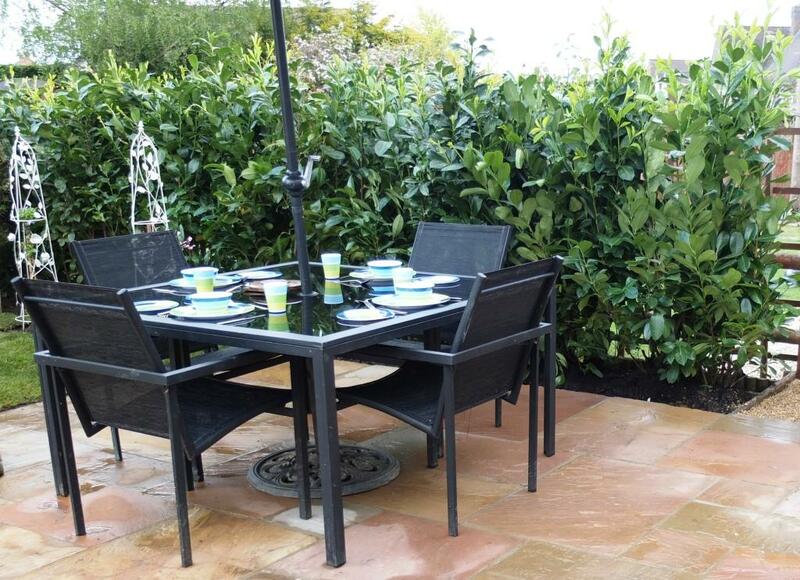 We wanted natural looking fencing to screen off the utility area at the back of Kathy’s garden. Hazel hurdles are perhaps the oldest form of fencing in Britain, dating back as far as Neolithic times 5000 years ago. Robust, beautiful and eco-friendly fencing, they are not only ideal for the traditional English Country Garden, but also provide gardeners in the 21st Century with the opportunity to create a unique, natural look for modern urban spaces. 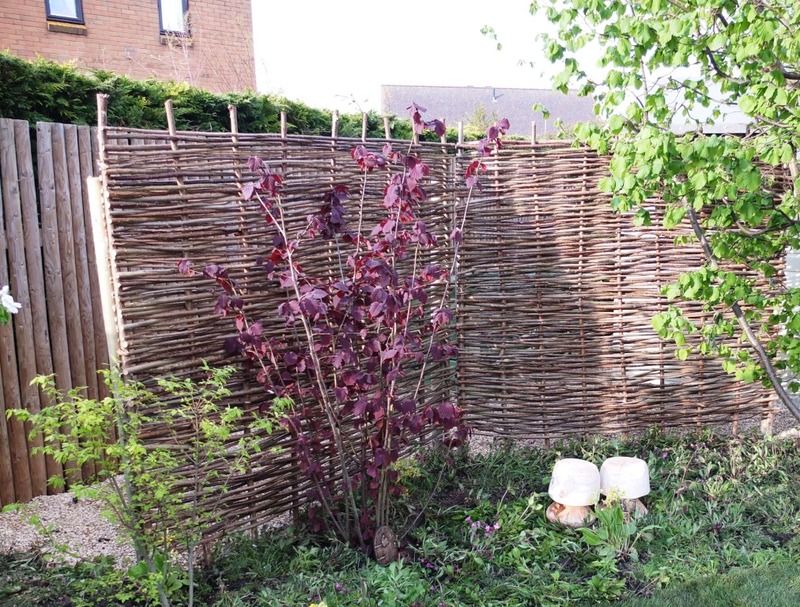 We used split hazel hurdles, which is made by splitting the hazel branches in two and weaving round whole upright stems. We kept Kathy’s hazel tree which is by the utility area and the fencing ties in with it perfectly. The hazel hurdles cost £51.95 each.